HI! 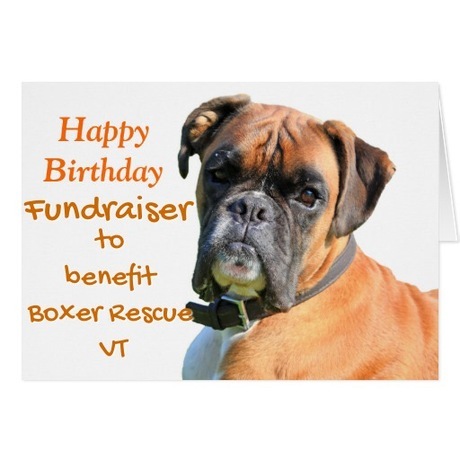 All I want for my birthday is for people to donate to help Boxer Rescue Of Vermont so that they can save more lives from kill shelters and get them vetted, socialized and into wonderful forever homes !! Please join me in celebrating my birthday by making a donation? Hige Thank you to Vitra & Matt for your generous donations ! Matthew Dixon11 weeks ago Best wishes. Elizabeth Reed11 weeks ago Hope this helps! Zella Anderson11 weeks ago Happy birthday! Thanks for all you do to hep the animals! Renee Weitzner12 weeks ago Best wishes. Janet Duran12 weeks ago Happy Birthday Bunny! Thank you fo all that you do for the pups! Bless you. Linda Ellerton12 weeks ago Happy birthday! Best wishes. Peggy Crowl12 weeks ago Best wishes. Janet Duran12 weeks ago Happy Birthday dear Bunny!! Thanks for all the precious lives you save and all the love you give them! Vitra Garcia12 weeks ago HAPPY BIRTHDAY, Bunny, and Many, Many Happy Returns of The Day!! I hope you get your birthday wishes - for a noble cause - to get more help for your rescues.